Your Max Explorer Cluster is the largest set of connecting, visited Explorer Tiles which each have their four immediate neighbouring tiles (above, below, left & right) also visited. In the above image, taken from my own Activities page, you can see all of the visited explorer tiles coloured in red & blue. The blue tiles are showing my Max Explorer Cluster. Each one of those blue tiles has a visited tile (i.e. red or blue) immediately above and to the side. As you can see near the top left corner, missing a single tile results in a hole of 5 tiles in the cluster. The idea is obviously to make the biggest cluster you can! Explorer checkbox turns the Explorer tiles, Max Square and Max Cluster on/off in the map. Max Square button – zooms to Max Square (turns on Explorer if not already on). Max Cluster button – zooms to Max Cluster (turns on Explorer if not already on). Explorer settings button – see below. On your Summary page you will now see your Max Cluster value in your Activity Stats. Like all the other stats on that page if you change the top filters then it will update with the requested values. 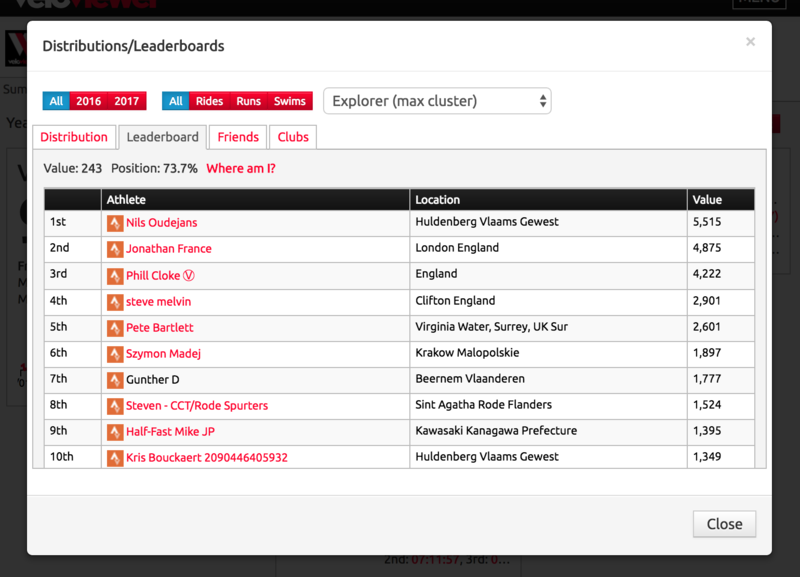 Click the “Club and Overall Yearly Leaderboard” button at the top right of your Activity Stats and you’ll now find an “Explorer (max cluster)” option for the distributions and leaderboards with all the normal filters (year and activity type) and group choices (overall, the athletes you follow and by club). For the Explorer stats it is probably best to view by all years. 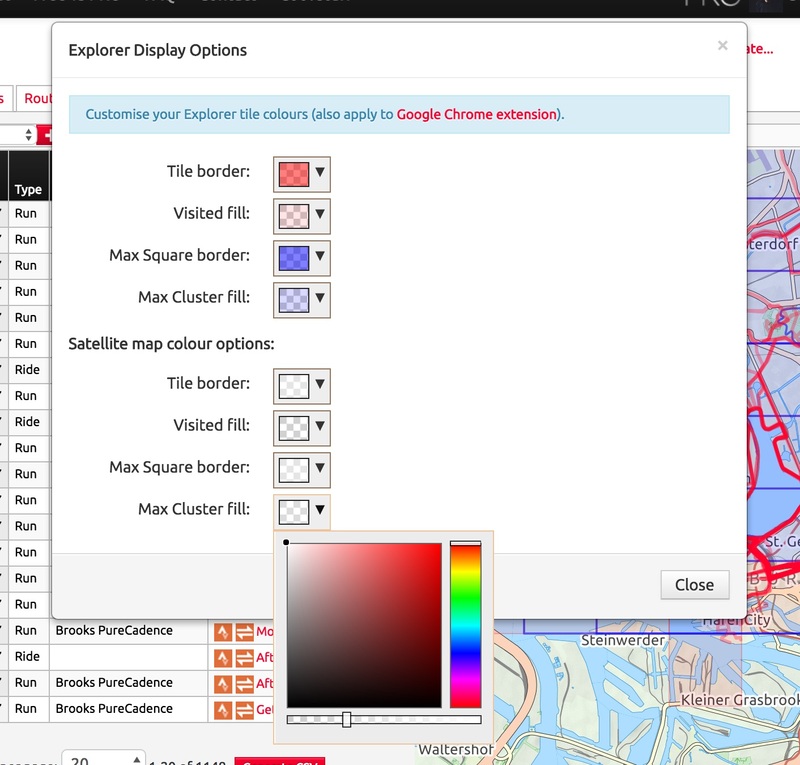 Earlier I mentioned the Explorer settings button that you find below the map on your Activities page, pressing that opens the above popup that allows you to choose all the colours used for the Explorer tiles, Max Square and Max Cluster both on this page and also in the Strava Route Builder when using the VeloViewer Chrome Extension. You can pick all of your preferred colours (and transparency) with separate options for satellite view map styles as you will probably want much lighter colours to show up on those sorts of maps. If you don’t want to see the new max Cluster on your map then you can just configure the colour of the Cluster to match that for a normal visited tile. Seems like an excellent solution to the max square issue, well done Ben and Ride Every Tile – perfect. I love this, question can you have more than one cluster? You only have one max-cluster but if you use any of the filters on the Activities list then the explorer tiles, max square and max cluster will be recalculated for the selected data. Could we get a max square and or cluster graph for the year like we do for eddington number or is this too computationally heavy? That’s already there Alex. On your Summary page just filter by year (or type/gear) to get it to calculate your explorer stats based on that. Yearly leaderboards are also available. On your Activities page then as you set filters the explorer tiles/square/cluster will also dynamically update. What would be really nice would be some kind of metric for how many feet you had to climb for each tile! I’m afraid that would be a bit too involved to work out as it would require the full data steam (lat/lng/elevation) for each activity. 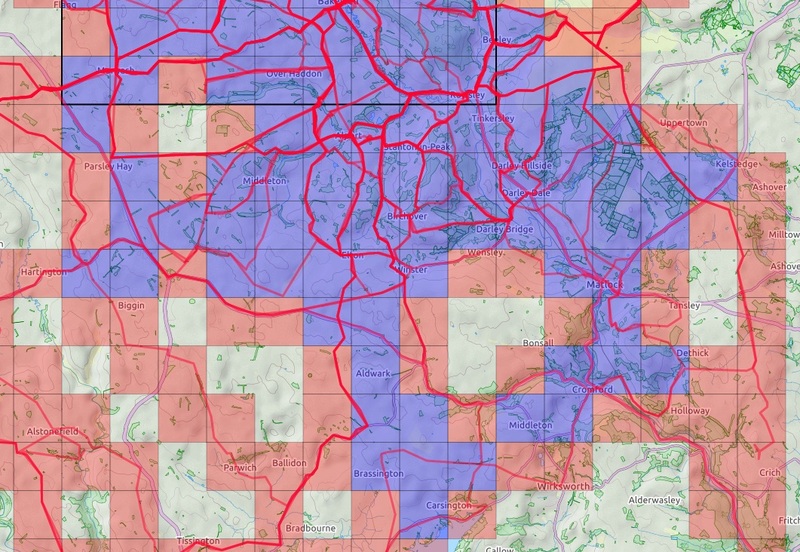 For the majority of the data it will be just using the lat/lng summary map so no elevation data available to the code at that point.
. Is it possible to exclude activity by Name or Run type? There is also a “Ride/Run Type” filter that you can use. The Explorer info in the map will update based on those filters. Is it possible to show Explorer score, Max square and Max cluster value in signature image? Not currently but I have them on my rather long to-do list. I like the Explorer feature and Cluster idea. I planned a ride using the Chrome VV extension which went really well, but I missed a tile due to my Garmin having a bit of a moment just South of Faversham. I thought there was a SNAP feature somewhere but I can’t seem to find it, any idea where it is? Otherwise I’ll have to ride it again, which isn’t the end of the world, just slightly annoying. Thanks! RaceShape was developed by a 3rd party developer (like me) many years ago and was acquired by Strava when they employed the developer. Strava then incorporated numerous elements of the RaceShape site (global heatmap and effort comparison) but it looks like the SNAP tool has bitten the dust. I think it would be rather interesting if you expressed the cluster not just as the raw number but as the square root of the cluster to give it an equivalence of the max square. Also adding a feature to the VV chrome plugin that shows tiles that you have already planned routes through would be amazing for planning multiple routes before going out and riding them. I think I’ll leave it as the simple total of clustered tiles. The geography of the area has a massive influence of the max square in a way that isn’t as applicable to Clusters (the main reason for introducing clusters in the first place) so I don’t think they are that comparable for lots of users. The routes one is a little more complicated as I don’t sync routes with VeloViewer so don’t have the map summaries to hand.